At the Auckland Food Show I scored a freebie, a sample of Chef Mark Harman's Seasons Pesto. It contains cashew nuts as well as pine nuts and on opening tasted lovely and fresh. 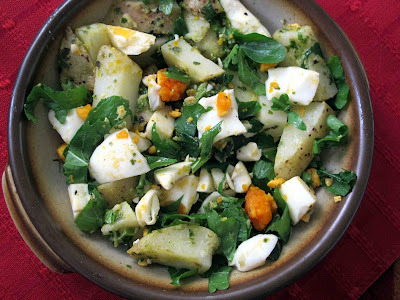 I used it in this warm potato salad which requires only 4 ingredients: potato, rocket, pesto and egg. You do need to use a good quality pesto like Mark's for this. Scrub a large potato (or two medium sized) very well. You don't want clods of earth in this salad. Cut the potato into small chunks. Microwave in a couple of tablespoons of water in a covered container (yes microwaves do have their uses sometimes!) until they are tender. Drain well. Hard boil 2 eggs then shell and chop . Stir the cooked potato, chopped eggs and 2 tablespoons of pesto together. Add a handful of rocket. It will wilt a little.